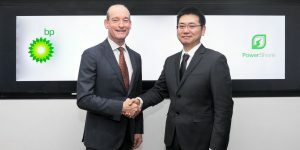 PowerShare of China provides an online platform that connects electric car drivers, charging point operators and electric utilities. It is used in cities such as Shanghai and is intended to help cope with growing pressure on power grids. By 2025, China aims to sell more than 7 million electric cars. Graham Howes, Managing Director of BP Ventures in Asia, described the issue and told Reuters that “grid operators are concerned about mobile demand,” with more and more electric vehicles taking to the road. He added, “PowerShare can monitor where vehicles are and where demand is in the system”. BP has maintained silence about the level of investment in PowerShare, but according to Reuters, the group’s venture arm typically invests up to 10 million dollars in a company. PowerShare is BP Ventures’ first direct investment in China but not the first venture into the electric vehicle charging infrastructure market. Last year, the oil giant already pumped capital into the fast-charging specialist FreeWire and the battery company StoreDot. Most prominently, BP’s acquisition of charging infrastructure provider Chargemaster, announced in June 2018, is also making progress. The name has now changed to BP Chargemaster and launched a corresponding website. Chargemaster operates the POLAR network in the UK with over 6,500 charging points. With this string of investments in electric mobility, BP is not alone. Their rivals Royal Dutch Shell and Total have undertaken similar moves. Shell, for example, is part of the IONITY effort to install high power charging stations across Europe. In their case, the partnership includes France, Austria, as well as Belgium, the Netherlands, Poland, Slovakia, Slovenia, the Czech Republic, Hungary, and the UK reportedly. However, such attempts of oil and gas giants trying to maintain relevance as the electric vehicle industry charges ahead must not be seen uncritically. Not the least because they enter into sometimes direct (and potentially unfair) competition with smaller but pioneering companies. Dutch Fastned had to go to court for their legal claim against the Rijkswaterstaat government, who permitted Shell to construct charging stations at locations already promised to Fastned. The highest Dutch court had recently decided that Fastned’s claim is valid. Update 18 February 2019: Following above investment of BP, another high-level investor has come on board. Alliance Ventures, the strategic venture capital arm of Renault-Nissan-Mitsubishi, has also bought into the e-mobility provider PowerShare. No information has been given on the amount of the investment.